CNN “New Day” co-host Alisyn Camerota grilled Charisma Magazine founder Stephen Strang on Wednesday in asking why he and other evangelicals continue to unconditionally support Donald Trump and seemingly brush aside or overlook alleged impropriety in his personal life. Strang is the author of the book “God and Donald Trump,” in which he asserts that Trump is a changed man and ponders whether there was a “supernatural element” involved in the results of the 2016 presidential election. 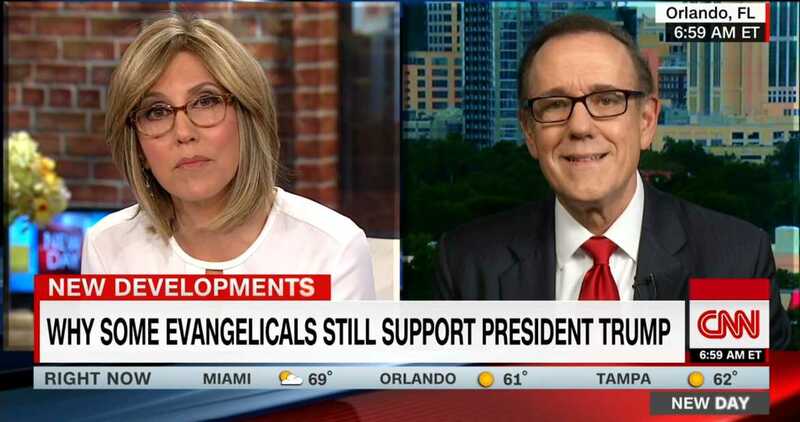 “Explain to us again how it is that evangelicals are willing to overlook these reports of infidelity and other things to support president Trump,” Camerota began. “So, what changed?” Camerota asked. He said that everyone has a past and no one is perfect, which provoked Camerota to note that owning up to wrongdoing and seeking forgiveness is a tenet of Christianity. She pointed to Trump’s statement that he’s never asked for forgiveness. “Well, that’s between him and God,” Strang replied. Strang repeated that the matter is between Trump and God, and advised that he’s more focused on Trump’s policies that protect religious freedom. Strang stated that there were only two people to choose from during the election, and he certainly wasn’t going to vote for Hillary, so he had to pick Trump. “Well, look. There was an election between two people, and the other person was Hillary Clinton, in my opinion, one of the most corrupt people to ever run for president,” Strang said. Camerota then asked about the women who accuse Trump of having sexual relations with them, and said that Trump has retorted by saying that he wouldn’t have done so because they are ugly. Camerota responded that, therefore, evangelicals knew but decided to overlook what they knew. She posited that Strang was consequently copying the media’s behavior that he had decried regarding Kennedy and Clinton. “Well, I’m also a journalist, so I can do that,” Strang said. He repeated that what Trump allegedly did happened a long time ago, and that he believes he has come to Christ since then. Camerota asked if Strang believes the 15 women that have come forward to claim that they were victims of improper touching and sexual misconduct. “I don’t know. I’ve not talked to the 15 women. I only know is what is in the media,” Strang replied.